…and the Ruth shall set you free! I’m preparing for Plastic-Free July, a month where I will be avoiding most single-use plastics. It’s 4 months away. Why do you need that long to prepare? You already have the reusable water bottle and bring your own bags to the store. What more do you need? There are still a lot of single-use plastics in my life. I want to find alternatives for them. I wash and moisturize my face in the morning. Your soap and moisturizer come in plastic. I put on my deodorant* that comes in a glass jar. And I brush my teeth with a bamboo toothbrush* and plastic-free toothpaste. That’s good. By the way, that toothpaste doesn’t have fluoride in it. Ask your dentist to make sure that’s ok. 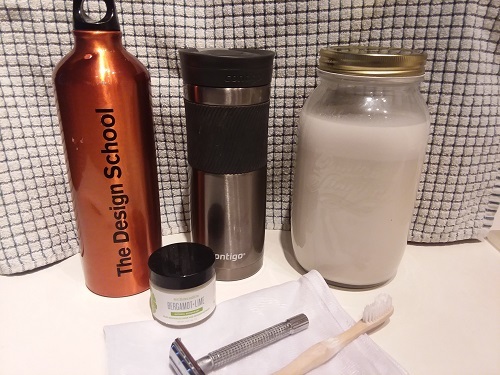 Some of my zero-waste and reusable products: water bottle, coffee mug, freshly-made almond milk, deodorant, safety razor, toothbrush, and produce bag. Then I have breakfast – a vegan protein smoothie or a vegan patty on a toasted bagel. I get to have both on my long workout days. The versions of all those products you’ve been buying come in plastic. And I have my coffee with almond milk. We make our own almond milk now, and we store it in a glass jar in the refrigerator. That’s because the carton has that plastic top on it, so we switched. By the way, we need to find a recipe for vegan butter since our brand comes in a plastic tub. I use reusable containers to take my lunch to work. After work, my preferred snacks are crackers or a small bowl of cereal. Cereal and crackers come in recyclable boxes, but they have plastic bags inside them. We’ll have to start making our own, find plastic-free brands, or switch to something else. Oh geez. Frozen fruits and veggies are staples in our diet. They all come in plastic bags. It’s going to be an adjustment. I don’t know if we can get berries that don’t come in a plastic container of some type. Perhaps at the farmers market. Wait a minute. Can’t we use plastic bags as long as we put them in the recycling bin at the store? The point of Plastic-Free July is to not use them to begin with. 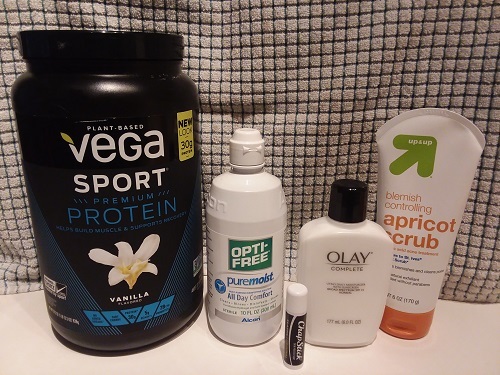 Some of the plastic staples currently in my life: protein powder, contact solution, lip balm, moisturizer, and face soap. We can still eat things from cans, right? As long as they’re BPA-free. After seeing the documentary, Bag It, I never want that stuff near me again. What about vitamins – and your prescriptions?! The pharmacy won’t let you BYO container for that. That’s true, but we can at least switch to brands of vitamins that come in glass. I will continue to take my medications as prescribed. Umm . . . what are you going to do about lip balm? You have like 5 of those going at a time. I will find a plastic-free brand. Rosie is exempt from plastic-free July, just like she’s exempt from my veganism. She’s 11 years old and blind. We’re not messing with her life. But I think it would be fun to try making our own dog treats for her. What about her dog poop bags? There may be some experimenting with alternatives like using newspaper or junk mail to pick up after her. Now you see why we’re taking 4 months to prepare. I’m looking forward to Plastic-Free July, but I have no delusions. I won’t have a 100% plastic-free life. I want to seek out and reward companies that don’t use plastic packaging and look for alternatives to products that I can’t get without plastic. This will be a challenge, and I’m looking forward to it. I am trying to be a better human. I eat a mostly vegan diet because I don’t like the idea of an animal suffering for my lunch, and after seeing this turtle suffer, I never want to use a plastic straw again. Inspired by videos about zero-waste living and zero-waste beauty options, I’ve looked at the products I use on a daily basis, and tried to shift to more zero-waste products. I wanted to share some of the little changes I’ve made in my everyday life. Please note, some of these items have affiliate links. This means if you follow the link and make a purchase, you pay the same as everyone else, but I get a small commission. Any link marked with an asterisk (*) is an affiliate link. Plastic-Free Toilet Paper: It is difficult to find toilet paper where the rolls come wrapped in paper, not plastic, and they don’t come in a 48-roll box. I don’t want a year supply of toilet paper in my home. So far, I’ve only found individual paper-wrapped rolls for sale at Sprouts. Bamboo Toothbrush: We’re supposed to get a new toothbrush every three months. I was so happy to find bamboo toothbrushes*, in paper packaging. They come four to a box, and each toothbrush is numbered, so if you have multiple people in your house using them, you can avoid accidentally using someone else’s toothbrush. They have the same durability as any other toothbrush I’ve used. Zero-Waste Deodorant: No more plastic containers of deodorant for me. My zero-waste deodorant* comes in a glass jar. You use the little spatula in the jar to scoop a little onto your fingers and then put it on your armpits like lotion. It’s a deodorant, not an anti-perspirant, so it doesn’t stop you from sweating, but you don’t smell when you do. Menstrual Cup: I will hopefully never have to buy tampons again. The menstrual cup* is a game-changer. Instead of using and throwing away three to six tampons a day during my cycle, I wear this reusable silicon cup inside my body and empty it two to three times a day. It took a few days to figure out the best way to remove it each time, but now it’s easy and convenient to use. Within a few months, this this has paid for itself because I haven’t had to buy tampons. 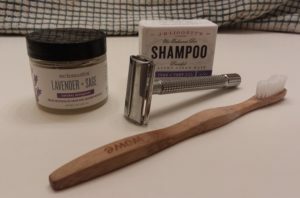 Safety Razor: I’ve always used razor cartridges that contained plastic, and I wanted to try an all-metal safety razor*. The angle is completely different than other razors I’ve used, and it’s just an exposed blade that’s cutting your hair. It’s easier to nick yourself. I still use my other razor for my armpits and bikini line, at least for now. Shampoo Bar: This shampoo bar* works great. I rub it on the top my head a few times to build up a lather and spread it to all of my hair. I suspect it could last longer than a typical bottle of shampoo. Laundry Soap in a Box: Do you know how hard it is to find laundry soap that doesn’t come in a plastic bottle or a pod? It was challenging to find laundry powder* that comes in a recyclable box, but I found it. It works just fine. 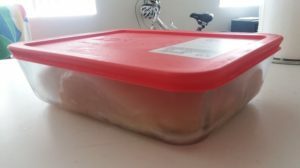 Reusable Food Containers: I still have resealable plastic bags in my home, and I do use them on occasion, but I try to use reusable glass containers*, and sometimes plastic containers I’ve had for years, instead of single-use bags. When I use plastic bags, I try to reuse them whenever possible. 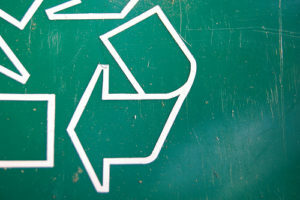 Bring my Recyclables Home: My office doesn’t recycle, so I bring home papers that don’t need to be shredded so they can be recycled. I have a designated pocket in my backpack for paper to be recycled. BYO Silverware: The office kitchen has single-use plastic silverware. Instead of using those, I keep a regular spoon and a fork at my desk for eating my lunch and snacks. BYO Water Bottle: I bring my own water bottle from home so I don’t have to drink water in plastic bottles. Metal Travel Mug: I have two ceramic mugs at my desk that I use to hold hot beverages and snacks, but I also have a metal travel mug* that I use when going out for coffee or attending events so I don’t have to use a single-use cup and plastic lid. Reusable Spork: One thing that is always in my backpack is my fold-able reusable spork* so I don’t have to use plastic silverware when I go to conferences. BYO Container for Meat: When I buy Rosie’s chicken, instead of buying meat in plastic and Styrofoam, I prefer to go to the meat counter and have them weigh the product and put it in a reusable glass container* I brought from home. BYO Jars for Bulk Foods: I like shopping in the bulk foods section at Sprouts. I bring my pre-weighed glass jars to get what I need. I label each jar with the weight of the empty jar so the cashier can take off that weight and only charge me for the product at check-out. Reusable Produce Bags: These reusable washable mesh bags are fantastic for produce. If a store gives a discount for bringing your own tote bags, they often give me a discount for each produce bag and jar I use. Going forward, I want to keep exploring options to be a better steward to the planet. I want to try composting, but have substantial doubts about my ability to maintain my own composting bin, so I’m more likely to try a composting service. I will also keep an eye out for zero-waste or plastic-free products. Once I run out of liquid hand soap, I’ll switch over to bar soap. I am interested in finding a zero-waste moisturizer. Putting coconut oil on my face sounds like a breakout waiting to happen. As I go through my day, I try to stay aware of when I use plastic products and look for zero-waste alternatives and/or ask brands to change to more sustainable packaging. Bamboo Toothbrush: The next time I need a new toothbrush, instead of buying a plastic one, I want to try one make of biodegradable bamboo. Zero-Waste Deodorant: Instead of buying a deodorant in a plastic twist-bottom tube, I want to try a natural deodorant that comes in a glass jar. I also wonder if something like this would be better for my sensitive skin. Shampoo Bar: Yes, there is shampoo that comes in a bar. I’m curious to see how well this will work. It’s going to be a while before I try it because I have short hair and it wasn’t too long ago that I bought a new bottle of shampoo. Regular Bar Soap: There was a time when we just had bars of soap next to the skin for washing our hands. I could go back to that. I wonder if I can find a bar of soap that has exfoliating properties that I could use instead of my apricot face wash. Asking Companies to Consider Lower-Waste Options: There are certain products that I know I won’t want to give up – like my moisturizer. I can ask them to consider offering a version that comes in glass instead of plastic. At least then they’d know there’s an interest. Reusable Produce Bags and Food Containers: Top of my list this year is to pick up some reusable produce bags so I don’t have to keep using plastic ones every time I go to the store. I often shop in the bulk food section of Sprouts for seeds, dried fruit, grains, and lentils. They don’t advertise this, but you can bring your own reusable containers to use after they weigh it. I want to get some jars and try this. Since my diet is rich in fruits and vegetables, I would love to compost the parts I don’t eat. 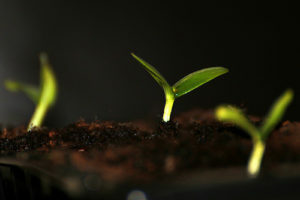 I currently don’t for a few reasons: (1) I’m afraid I’ll do it wrong and create a smelly mess that will attract rodents and bugs and (2) if I use vermicompost (aka worms), I’m afraid I’ll kill them and have a smelly mess that will attract rodents and bugs. (The fear is real – I’ve killed a cactus.) My city collects landscape waste, but not food scraps for composting. If I want to try it, it appears Arizona Worm Farm sells a ready-to-use worm bin. I’m excited to try new products as I need them and see what works. I am a licensed attorney in the State of Arizona; however, this blog should only be used for informational and entertainment purposes. It does not constitute legal advice, and it does not create an attorney-client relationship with anyone. If you need an attorney, hire one. This website has a terms of service.